HONG KONG (CelebrityAccess) — MTR, the company that operates Hong Kong's Metro system, rejected a poster advertising Madonna's upcoming 'Rebel' tour unless a warning label was added. 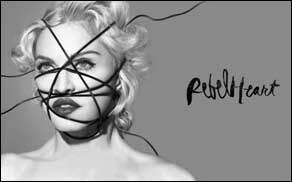 A spokeswoman for Universal Music Hong Kong that the poster, which depicts Madonna with a black leather string wrapped tightly around her face, might lead copycat children to accidentally strangle themselves. A second poster, depicting Madge lying on the floor in what appears to be a leopard-swimsuit and red top was approved. ”We were told to only use the one with her lying on the floor. But we wanted to use both,” the record company spokeswoman told the South China Morning Post.